The revolutionary design of the SightPro Atomic QR makes it one of the smallest traditional dot sights on the market. This ultra compact feature makes it a superb choice for a number of different applications. Thousands of test rounds had virtually no effect on its ability to hold zero. 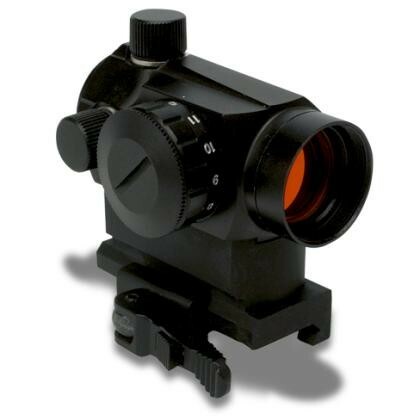 This rugged scope is ideal for use atop AR rifles thanks to the 1" riser. The quick release base includes a locking lever that allows you to transition the scope from one fire arm to another and securely attach it without fail. The 3.5 MOA dot illuminates in red for the brightest of conditions and has 11 intensity modes for virtually any lighting condition. It also has dual mount capabilities, so it can fit on a standard Weaver style base, or on Pictatinny rails.